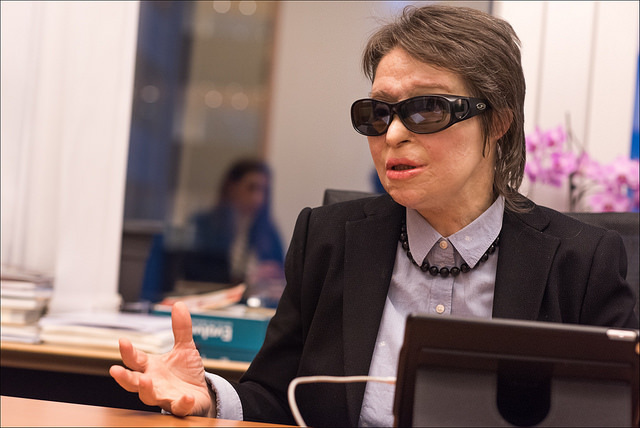 The European Accessibility Act for people with disabilities opens a “huge horizon” and new innovation fields for everybody, but its scope should be widened to more products and services, MEP Konstantina Kuneva said in an interview with euractiv.com. Konstantina Kuneva is a Greek Syriza MEP affiliated with the European United Left/Nordic Green Left political group (GUE/NGL). In 2008, Kuneva was attacked by two men in Athens who threw acid in her face causing permanent damage to her body, vision, and voice. “Someone decided to punish me for being a woman and trade unionist,” Kuneva said. In 2014, she was elected as a member of the European Parliament with the support of the Syriza-led government. She spoke with euractiv.com’s Sarantis Michalopoulos. What are the main challenges regarding EU plans to harmonise products and services to make them accessible for disabled people? For me, the main challenges are five. First, the timing and the scope of the Directive itself. The draft Directive provides an application in six years, a period long enough; especially if we think that we are talking about digital products and services very often revolving in a short life cycle. Also, the scope of the Directive itself does not ensure the accessibility of the disabled in a number activities, such as access to a hotel accommodation or the use of household appliances. Secondly, it’s the issue of supervision at European and national level. The EU itself should oversee the rapid harmonisation of national laws and not delay the implementation of the Directive. Then, the member states should set up powerful control mechanisms that will detect, for example, how well-founded the business applications for exemption from the uniform accessibility rules are. Let’s not forget that in member states there are currently no market supervisory authorities for products and overall compliance of accessibility for people with disabilities. Thirdly, it is important to include in the new legislation the built environment. For example, based on the Directive, an ATM should be accessible to people with disabilities. But the obligation of a bank should not be limited to it. If there is no bar, the right elevator for wheelchairs, special access for people with vision problems who want to get in a bank or in the office, if there is no suitable staff to understand the behavior of a person with mental retardation, what sense would accessible products and services have? The accessibility of the built environment is a prerequisite for all. This is underlined by all organisations and agencies in the disability field. And they are right. In addition, the European Accessibility Act results in obligations of private enterprises to adapt products and services they provide. But there are obligations arising for the member states. What will be the guarantor of economic accessibility to these goods and services? Will a citizen (a person with disabilities or elderly) have the financial means to purchase? So, we must make sure that the conversion cost for a product to become accessible will not pass to people with disabilities. Besides, we are well aware of the fact that disability leads to poverty easier. Unemployment rates in the disability field are very high. Consequently, accessibility cannot be only for those few who have some income. Moreover, the new Directive is a good opportunity for the EU to control what is done with the previous directives. That is to check to what extent they have been implemented and how effective they are for people with disabilities. How do you think that EU legislation should be structured so as to avoid “creating new barriers to innovation”? I would say that the new directive is opening new horizons and a new, huge innovation field for businesses, researchers, scientists, and the 80 million people with disabilities. But the EU should also provide incentives for research and design accessible products not only to multinationals but also to SMEs. Could that Act be a “win-win” game for all? Of course. We are talking about 80 million people with disabilities. And even the European Commission predicts that this number will increase in the coming years. Speaking in strictly economic terms, it is a big market that opens for business. Businesses can see people with disabilities as consumers too, who must have equal opportunities like everybody else. But the problem is that companies usually only see the short-term benefits, what will earn this year or in two years’ time. On the contrary, they should see the benefits in the long term in working for 500 million people, without exclusions and marginalisation. On the other hand, the EU has ratified the UN Convention on the rights of people with disabilities. So it is obliged to apply this Convention, which explicitly defines accessibility in all areas of their rights. What are your main concerns? The European Parliament’s Culture and Education Committee recently voted to exclude the audiovisual media services, including television programs and e-books, from the European Accessibility Act. Does this make sense? Truly, I do not understand this decision. The main criticism the European Commission’s proposal for a European Accessibility Act received was that it had a limited scope. It is not possible to limit it further, especially since the collective bodies representing the disabled people propose to extend the scope of the Act to more products and services. I’ve heard that their position is that a specific and separate Directive on access to audiovisual services must be advanced. But I believe that this will delay things. With the European Accessibility Act, we are granted now an ideal opportunity. For many people with disabilities, services for audiovisual means, a television program, a movie, is a window to the world. We cannot deny them the right of access to culture and art. It’s also not right that we, the MEPs, should vote to cut the rights of disabled people in order to protect different business sectors. Because at the end of the day, we do not offer good services to the business sectors either, as we exclude them from a large group of people.